I am teaching a whole weekend of workshops to a craft group in Wales at the beginning of April and on the Saturday I will be repeating my vintage tag book but on Sunday they would like a day of journaling, so I am preparing some things to take with me. This is a page made on card and then stuck into my large Dyan Reaveley journal book. I had fun using Dylusions sprays, Dyan’s masks ……. I also used a large Pronty alphabet mask and picked out the letters to spell REBEL, painted them in with white paint and outlined them with black pen. Just the way I felt at the time I guess and I am a bit of a rebel at heart you know. … oh and I added a Dina Wakely stamp for the focal image. Well we've got more rain again today, the garden is saturated and boggy, I am so looking forward to some dry and sunny days. My dear friend Terry in California keeps teasing me by sending 'warm' hugs, which are lovely, but I need the sun to go with them lol. It's my murder mystery party tomorrow, the one that couldn't go ahead on New Year's Eve because of illness. I am looking forward to hosting this as I have written it myself and have re-themed it for a Valentine party, so fingers crossed the murderer doesn't get recognised too early!!! Enjoy your murder mystery weekend, sounds fun! And here I am again sending some WARM hugs, but soon enough you will be here! Oh I wish you could send us some of your rain - really! I so am in love with your page. That focal image in red is so eye catching and love that border! Well my busy friend, have a wonderful weekend! Hugs! Beautiful Journal pages, the classes will be brilliant! Oh Brenda, I just love the idea of a Murder Mystery - I do hope you all have great fun! Wonderful stamping and colours, Brenda! Have fun with your murder mystery! We can all relate to being a little rebellious on times, I love your page, everything about it relates warmth, I hope you enjoy Wales. What a cool page, Brenda - such a different look for you, but just goes to show you can turn your hand to anything and make it sing!! Fabulous masking and stamping, and I love the REBEL letters. Hope the murder went brilliantly! Hope you had a great time at the party Brenda. Beautiful page of gorgeous colours. Such an awesome page here made with the most amazing colors too. Really gorgeous work brenda. Wonderful pages, I love all the layers and the colours are gorgeous. A fantastic journal page, I'm sure your workshop weekend will be great. 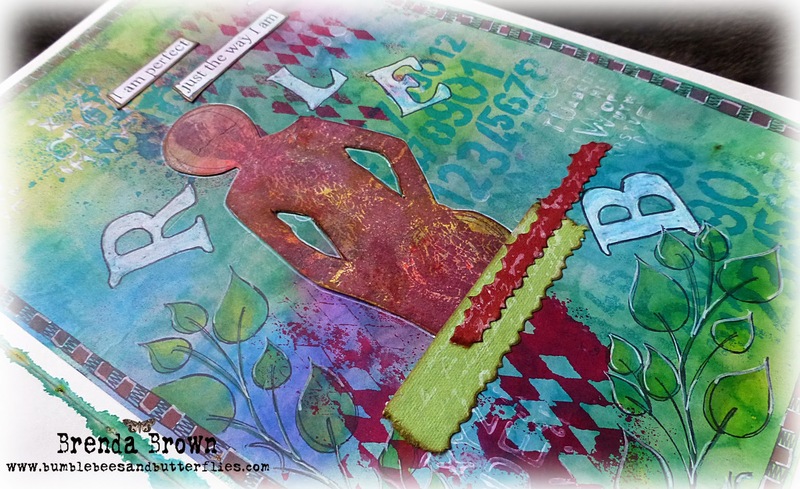 Wonderful journal page, it will be a hit at your workshop classes. Wish I lived closer Brenda, looks like a Fabulous class! Such a beautiful page... no doubt they will love this in the spring. Hope your party is wonderful! A most fabulous blend of colours and textures. They are so fortunate to have you as their teacher. I love the idea that you created this on card and will insert into your book. For someone who is still timid of art journalling this would be an approach I would find easier than the fear of spoiling a new journal. A stunning mixed media project. Love how you did the wording. I hope the class was fun - the journal page is great. I like the different dimensions that the stencils and stamps create. Also, love the word REBEL! You must have a cook and a house keeper. I can't keep up with your blog much less make so much! Your work is wonderful Brenda.